impartial to your subject when doing a review or an interview. Well, there are very few times when you get to sit and chat with someone who is legitimately a legend in this scene. I had that opportunity to do just that recently. A friend of mine has gotten himself some pretty cool contacts up in Stillwater lately and somehow my name and this little website came up in conversation. A few days later, I sat and had a 40 minute conversation with one of the people I most admire in this music scene, John Cooper from The Red Dirt Rangers. 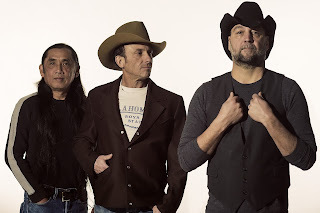 The RDR are one of the bands that have been at the forefront of the Oklahoma music scene for well over 20 years. In fact, they are celebrating 25 years together this year. So as you can imagine, they have quite a history, an incredible legacy and countless numbers of Okie musicians who call them an inspiration or influence. What could they possibly have left? You would be surprised. If you have a minute, stay a while. I will tell you what I know. In celebration of their 25th year the Rangers, John Cooper- Brad Piccolo- Ben Han have set out on what they call the "Oklahoma Wold Tour." Though it may not seem like a big deal, a more frequent show schedule is something that the guys haven't done in a while. They do play quite a few shows throughout the year but are making a point to get out more and get to places they haven't been to in a while. In fact, they recently played 2 shows at Willie's Saloon on the Strip in Stillwater, OK. That is something that hasn't happened in years. There is a new album in the works. John said that they took their time with this album and have made the effort to put out what he called their fist true studio album. The album Lone Chimney boasts no less than 4 Grammy nominated musicians. Lloyd Maines, Steve Ripley, Fats Kaplin and John Fullbright are all supporting the band in studio. It was recorded on 2 inch tape which gives the album an old school vibe. Coop told me that this album was so different from their previous records that he almost couldn't believe how good it sounded when he heard the first playback. The recording is done and all that is left is production and advertising To finalize that side of it, the band recently put out a kickstarter campaign to finish the odds and ends. See that here KICKSTARTER. So that has to be it right? NOT EVEN CLOSE! John and Brad host a weekly Radio Show on KOSU that showcases the music that they know and love. Music that has inspired and influenced them. You can hear that here. John is very active in the Red Dirt Relief Fund and organization that helps musicians in time of need. Brad and Coop also do a play together. They take us on a journey down a road of what if. 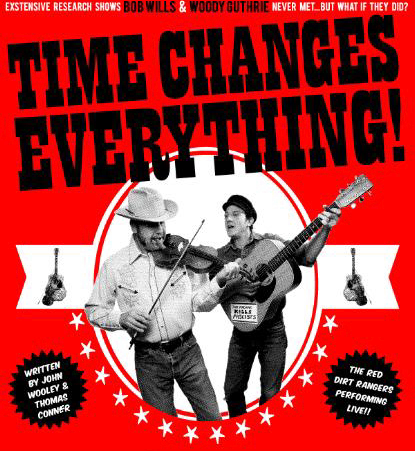 What if Woody Guthrie and Bob Wills had crossed paths at some point. Who wouldn't want to be a fly on the wall in that room? If you can name another group of guys that are more involved in nearly aspect of a music scene, well... I'd just have to call you a liar. So, from my talk with Coop it was clear that the Rangers are nowhere near ready to step away from what they love. They continue to be pioneers in the Red Dirt scene. The music they make continues to connect to fans both old and new. 25 years together and still improving on perfection.